Latin Origins & Authorship. This venerable hymn is sometimes associated with a remarkable legend: according to Hincmar of Reims, in his De praedestinatione (859), the hymn was produced spontaneously in alternation between St. Ambrose (c. 337–397) and St. Augustine (354–430) on the night of Augustine’s baptism (387). The evidence of authorship, however, weighs in favor of Nicetas (c. 335–414), bishop of Remesiana (modern Bela Palanka, Serbia), but some modern scholars prefer to simply regard it as anonymous, for lack of definitive evidence. The hymn can be dated confidently to the early fifth century because it was included in the rules of early monastic orders, such as the Rule of St. Caesarius and the Rule of St. Benedict. 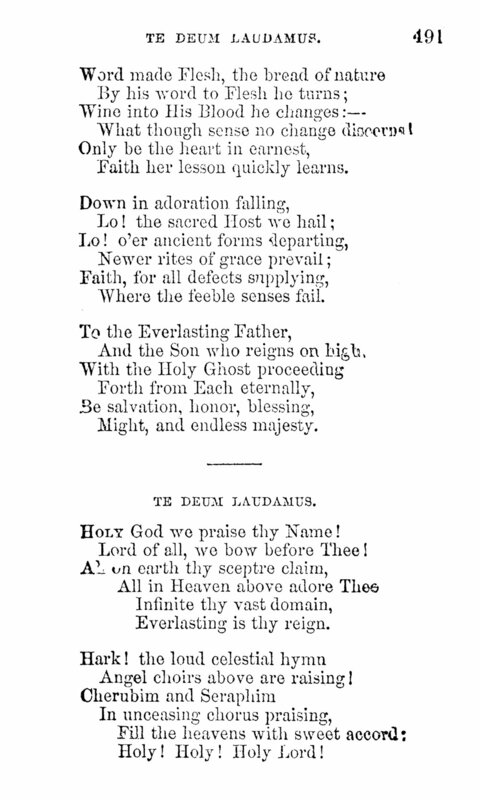 Extensive data on this hymn, its manuscripts, variants, and its possible authors, can be found in John Julian’s Dictionary of Hymnology (London, 1907), pp. 1119-1134 (Google Books). Fig. 2. The Liber Usualis, ed. Benedictines of Solesmes (NY: Desclee Co., 1961). Analysis. The hymn contains many allusions to other Scriptures and texts. Influences include a clear citation of Isaiah 6:3, “Holy, holy, holy is the Lord of hosts;” an allusion to de Mortalite by St. Cyprian (d. 258), beginning with the Apostolic chorus, and numerous excerpts from the Psalms, including 24:7-10, 110:1, 28:9, 115:2, 123:3, 33:22, and 31:2, in that order. Translation 1: English. The hymn was translated and adopted into the first Book of Common Prayer in 1549 (Fig. 3), to be used daily at Matins (except during Lent), thus making its presence known to English worshipers since the dawn of English liturgy. The Lent restriction was removed in 1552. Fig. 3. The Booke of the Common Prayer (London, 1549). Translation 2: German-English. The Te Deum was also adopted into Lutheran worship, as paraphrased by Martin Luther (1483–1546), “Herr Gott, dich loben wir.” This was probably included in Joseph Klug’s Geistliche Lieder auffs new gebessert (Wittenberg, 1529), now lost; from there, it was printed in Geystlyke leder uppt nye gebetert (Rostock, 1531), then again in later editions of Klug, including this 1533 printing (Fig. 4). Luther’s version is not a hymn, but an adaptation intended for antiphonal singing, perhaps a nod to the legend of Ambrose and Augustine. Fig. 4. Joseph Klug, Geistliche Lieder auffs new gebessert (Wittenberg, 1533). Luther’s version was translated into English by Richard Massie (1800–1887), in Martin Luther’s Spiritual Songs (London: Hatchard & Son, 1854 | Fig. 5), as “Lord God, Thy praise we sing.” For a musical setting of Massie’s translation, in the style of Luther’s antiphonal design, see Leonard Bacon & Nathan H. Allen, The Hymns of Martin Luther (NY: Charles Scribner's Sons, 1883), pp. 55-59 (PDF﻿). Fig. 5. Richard Massie, Martin Luther’s Spiritual Songs (London: Hatchard & Son, 1854). Translation 3: German–English. The most prominent hymnic version of the Te Deum in common usage comes by way of an anonymous German translation, “Grosser Gott, wir loben dich,” the text of which was first printed in Die Christlich-katholische Lehre in Liedern (Sagan, 1768 | Fig. 6), in twelve stanzas of six lines. The hymn is labeled “Melody No. 31 or 32,” but the only known copy at the University of Augsburg does not contain any melodies. An earlier edition from 1766 (here) only contained 23 melodies, so the intended musical setting for this first printing is unknown. This text and/or its related tune is sometimes credited to Ignaz Franz (1719–1790), based on its subsequent appearance in his Allgemeines und vollständiges Catholisches Gesangbuch (Bresslau: Johann Friedrich Korn, 1778), but his version began “Herr und Gott, wir loben dich” and the hymn had appeared a few times previously without attribution. The attribution to Franz is not well founded and is generally regarded by hymnologists to be spurious. Fig. 6. Die Christlich-katholische Lehre in Liedern (Sagan, 1768). Another important early printing of the text was in Katholisches Gesangbuch (Wien, 1774), also in twelve stanzas of six lines (Fig. 7), with some changes. For many years and in many commentaries, this was regarded as the earliest source of the text, and it still is known as the earliest source of the melody GROSSER GOTT (more on the tune below, Fig. 11). Fig. 7. Katholisches Gesangbuch (Wien, 1774). 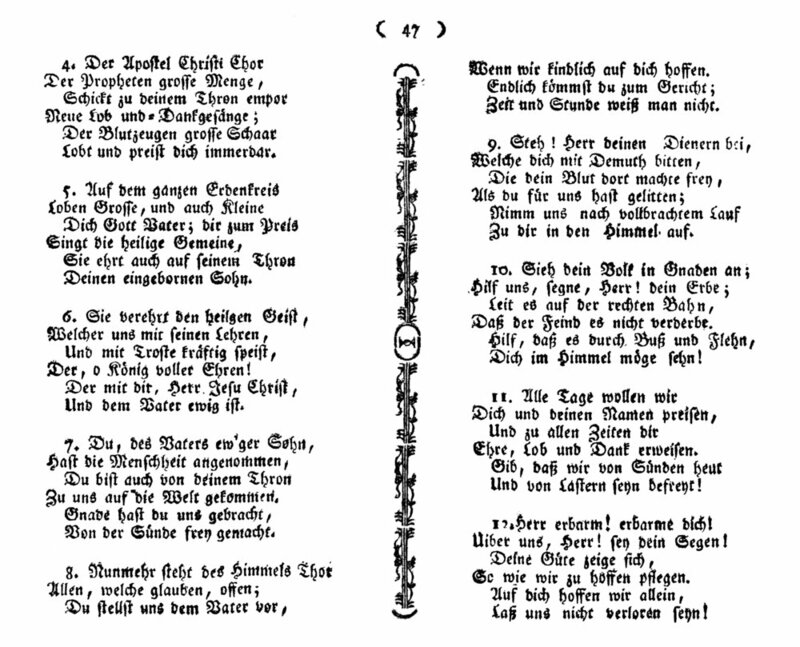 This German rendition of the Te Deum entered English hymnody through a translation by Clarence Walworth (1820–1900), who was a member of the Catholic Redemptorist missionary society. He was trained in Belgium (1845–1848), ordained in Holland (1848), and served in England (1849–1851) before returning to his native United States, where he served St. Mary’s Church in Albany, NY for many years. “Holy God, we praise thy name” was first published in The Mission Book: A Manual of Instructions and Prayers (New York : M.T. Cozans, 1853 | Fig. 8) in seven stanzas of six lines. His paraphrase of the Te Deum is not a direct translation of the German, it is a new translation of the Latin following the metrical pattern of the German. Fig. 8. The Mission Book: A Manual of Instructions and Prayers (New York : M.T. Cozans, 1853). Fig. 9. Clarence A. Walworth, Andiatorocté (NY: G.P. Putnam’s Sons, 1888). Translation 4: English. Among the more recent translations is “God, we praise you! God, we bless you!” by Christopher Idle, written in August 1978 while he was recovering from a surgery, staying at a home on the Wirral peninsula near Liverpool, England. Idle’s hymn was first published in Hymns for Today’s Church (1982). A fuller story behind the hymn can be found in Idle’s Light Upon the River (London: St. Matthias Press, 1998), p. 216. Tune 1. Christopher Idle’s preferred tune for his paraphrase is LUX EOI, by Sir Arthur Sullivan (1842–1900), from Church Hymns and Tunes (1874 | Fig 10). In that collection it appeared twice, with “Hark, a thrilling voice is sounding” by Edward Caswall (1814–1878) and “All is bright and cheerful round us” by John Mason Neale (1818–1866). It is frequently paired with “Hallelujah! Hallelujah! Hearts to heaven and voices raise” by Christopher Wordsworth (1807–1885). Fig. 10. Arthur Sullivan, Church Hymns and Tunes (1874), no. 67. Tune 2. 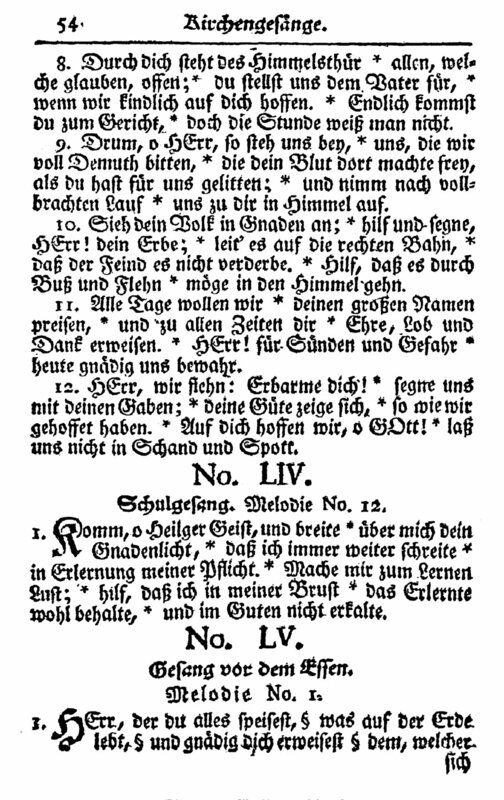 The German tune for “Grosser Gott, wir loben dich” was first published in Katholisches Gesangbuch (Wien, 1774 | Fig. 11), labeled “Melodie No. XLII.” The first musical phrase repeats, giving it a structure of AAB (“bar form”). Fig. 11. Katholisches Gesangbuch (Wien, 1774). Over the next several decades, the melody was reprinted and altered in ways that have been documented by Wilhelm Baümker, in Das katholische deutsche Kirchenlied, vol. 3 (Freiburg im Breisgau, 1891), pp. 285-287 (PDF), and also by Johannes Zahn, in Die Melodien der deutschen evangelischen Kirchenlieder, vol. 2 (Gütersloh: C. Bertelsmann, 1890), p. 418, no. 3495 (PDF). Zahn gave the normative version of the tune from Allgemeines Choral-Buch für Kirchen (Leipzig, 1819), while Baümker pointed to Heinrich Bone’s Melodieen zu dem katholischen Gesangbuche Cantate (1852). Given that the tune entered English hymnody before 1852 in forms resembling (but shortened) from the melody recognized as GROSSER GOTT, the 1819 source is better understood to be the springboard for the received shape. The tune entered American collections via the 9th edition of Lowell Mason’s Boston Handel and Haydn Society Collection of Church Music (Boston, 1830 | Fig. 12), where it was dubbed FRAMINGHAM. In this version, the repeat of the opening phrase was eliminated, reducing it to an AB structure, and pickup notes were added to accommodate an iambic long-meter text. The melody is in the tenor part (third line). The tune was paired with “Come hither, all ye weary souls” by Isaac Watts (1674–1748). Fig. 12. Lowell Mason, Boston Handel and Haydn Society Collection of Church Music, 9th ed. (Boston, 1830). Melody in the tenor part. On the other side of the Atlantic, the tune entered English and Irish hymnody through David Weyman’s Sequel to Melodia Sacra (ca. 1844), vol. 2, where it was named STILLORGAN (PDF / also Fig. 13) and set to “Jesus, and shall it ever be,” by Joseph Grigg (1720–1768). This version of the tune, like Mason’s, represents a partial AB structure, but it has a repeated final line, making it a phrase longer. To accommodate the long-meter text, Weyman started each phrase with triple notes rather than the pickups employed by Lowell Mason. Fig. 13. David Weyman, John Smith & R.W. Beaty, One Hundred Fifty Hymns from the Sequel to Weyman’s Melodia Sacra, Arranged for One, Two, Three, or Four Voices (Dublin: Marcus Moses, n.d. [1840s]). This tune was subsequently printed in The Metrical Psalter (London: Novello, 1855) edited by William Irons and Henry Lahee, set to John Keble’s hymn “Sun of my soul! Thou Saviour dear,” similar to Weyman’s version, but without the elongated ending. The relevant image is shown in that article as Figure 2. From there, the tune was adopted into the first edition of Hymns Ancient & Modern (1861), where it was named HURSLEY after the parish where John Keble was vicar. It was also adopted into the Irish Church Hymnal (1864) and its successors. 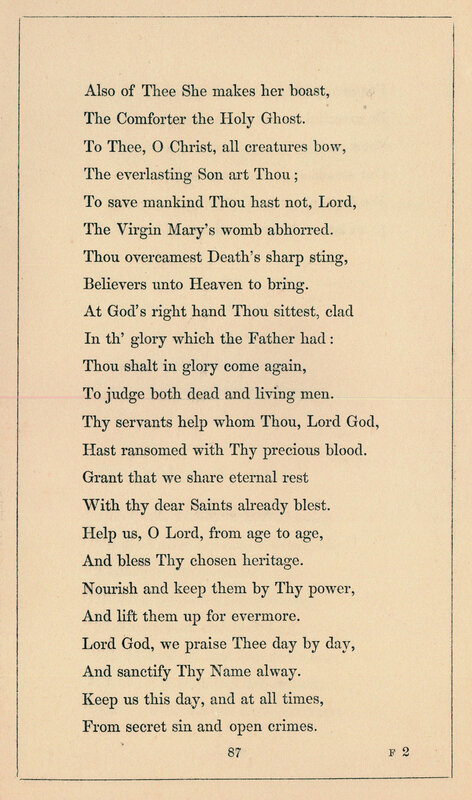 The full version of the tune, GROSSER GOTT, in its original AAB structure, was printed with Walworth’s text in The Catholic Psalmist (Dublin: James Duffy, 1858 | Fig. 14), edited by C.B. Lyons, and it has enjoyed a long relationship—as it should—with the English version of its German root text. Fig. 14. C.B. Lyons, The Catholic Psalmist (Dublin: James Duffy, 1858). Ron Jeffers, “Te Deum,” Translations and Annotations of Choral Repertoire, vol. 1 (Corvallis, OR: Earthsongs, 1988), pp. 215-220. Johannes Zahn, Die Melodien der deutschen evangelischen Kirchenlieder, vol. 2 (Gütersloh: C. Bertelsmann, 1890), no. 3495. F.E. Warren, The Antiphonary of Bangor, vol. 4 (Pt. 1) & vol. 10 (Pt. 2) (London: Harrison & Sons, 1893-1895). The Hymnal 1940 Companion, 3rd Rev. Ed. (NY: Church Pension Fund, 1956), pp. 121-123, 179-180. Maurice Frost, “Sun of my soul, Thou Saviour dear,” Historical Companion to Hymns Ancient & Modern (London: William Clowes & Sons, 1962), p. 140, no. 24. Raymond Glover & Carl Schalk, “Holy God, we praise thy name,” Hymnal 1982 Companion, vol. 3A (NY: Church Hymnal Corp., 1994), no. 366. M. Huglo, “Te Deum,” New Catholic Encyclopedia, 2nd ed., vol. 13, pp. 771-773. “Te Deum: Two Versions,” Companion to Church Hymnal, ed. Edward Darling & Donald Davidson (Dublin: Columba Press, 2005), pp. 903-907. Carl P. Daw, Jr. “Holy God, we praise your name,” Glory to God: A Companion (Louisville, KY: Westminster John Knox, 2016), pp. 5-6.